I was recently chatting with a friend who’s considering spending a few months in another country with her family. It’s a big decision and she’s not sure if it’s the right one. Couldn’t their travel bug be cured by a road trip within the country? There are a lot of unknowns and what-ifs about up and moving to a totally different country and culture, especially if you don’t know the language! After she asked me the question, there was silence on the line. It felt like someone had asked me why I drank water or why I ate food every day. I don’t know why I was born with an adventurer’s spirit, but I was. And I will tell you, that as much as I’d traveled before that, our two-week trip to Asia changed me. It changed my life. It changed my perspective. Do you know that there is an entire continent with billions of people who has absolutely no idea or no knowledge of how we in the Western world live our lives? (And if you’re a part of that continent, same goes for you, just substitute the word “Eastern”). For me, that was the biggest take away of our trip to Thailand, Singapore, and Indonesia. There are so many people who are living their lives half a world away, completely oblivious to our oh-so-important goings on in the Americas. That was, paradoxically, an extremely comforting feeling. My life was just a life, just one life in the middle of billions of other lives. This feeling that I experienced and am having a difficult job putting into words is part of the perspective shift that I love so much about traveling to new places. We didn’t speak Thai, Chinese, Malay, Tamil, or Indonesian. We didn’t know much about the cultures we were visiting before embarking on our trip (I would do more studying and research next time). But we made it work. We found people who speak English, which is luckily almost a universal language, especially in trafficked tourist areas. We ate the food. We drank the water. We lived to tell about it. There were a couple of bouts of stomach troubles, yes, and a couple of times when we feared for our lives when crossing the crazy streets of Bangkok, but overall, our experiences there were amazing. 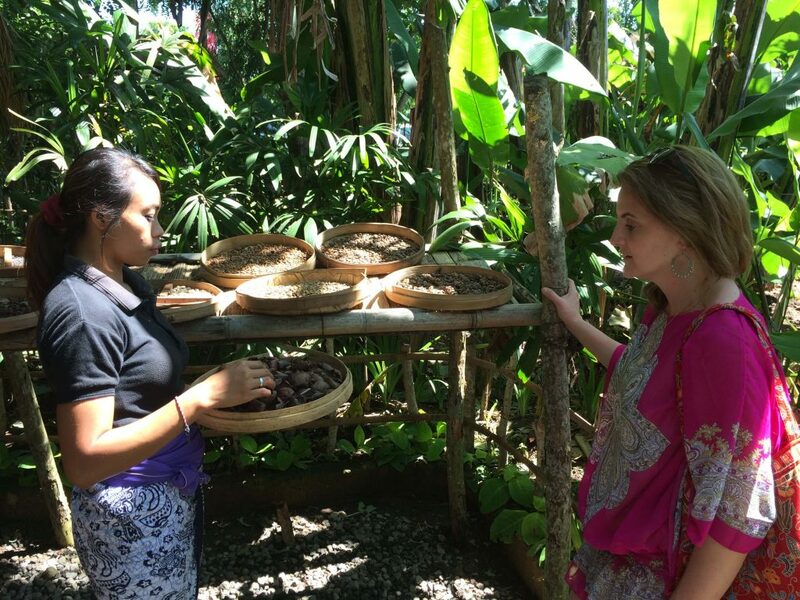 Experiencing Kopi Luwak, coffee beans pooped out of an Indonesian animal, and reportedly ultra delicious. We were neutral after our taste test. 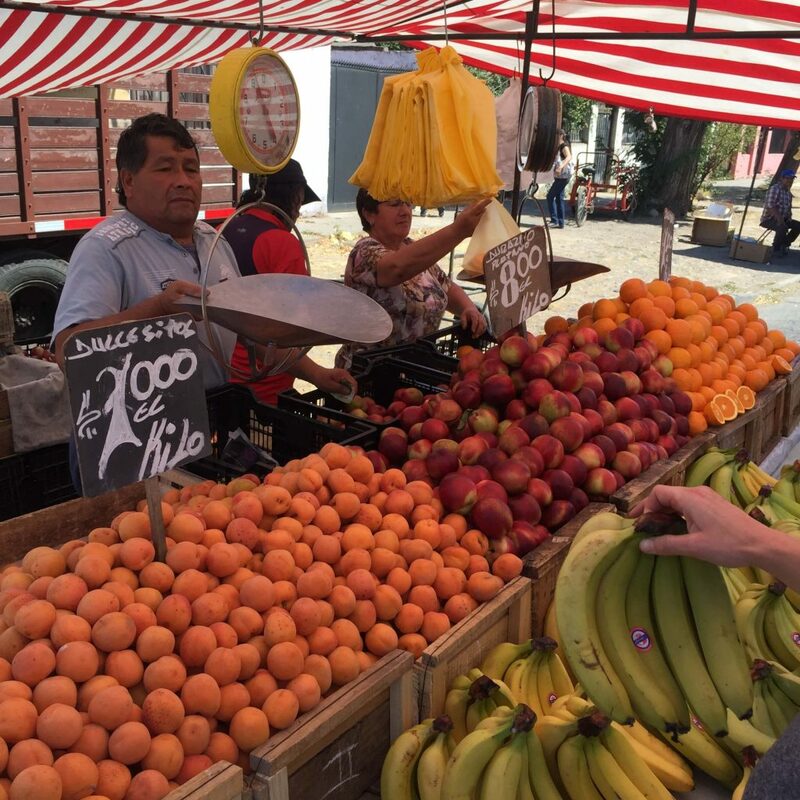 We are very fortunate that we’ve been able to take our kids to South America so often. While they’ve been relatively young during our trips, they’ve been able to observe how people from another culture do life. They know that houses in this country tend to be vastly larger than houses/apartments in Santiago, and they have made the independent assessment that they like smaller spaces (“but not too small, Mom”). I was sixteen the first time I traveled to another country. My dad helped me get my passport. We’d been taking Spanish lessons with my Puerto Rican neighbor, Mr. Cobb. We traveled to Honduras for seven days to bring medical supplies and care to the people of Limón, a remote town near La Ceiba. A doctor in my hometown had set up a clinic there and my dad was taking a team of doctors, dentists, pharmacists, and high school students along to help. I was young, innocent, and sheltered. And I saw poverty that I couldn’t fully comprehend. But I made friends with girls my age who made me lists of Spanish words and to whom I sent my extra keyboard. I played with kids who climbed coconut trees for me to send coconuts down, still in their shells, that they then hit with machetes to release the nut. I was invited into their houses, where I saw refrigerators that held books, because there was only electricity in the town for an hour a day. I saw girls, much younger than me, taking care of their infant siblings all day long because their parents were working. I was proposed marriage by a toothless man who made his home amidst a trash dump. I ate iguana. I remember so much of the trip vividly. I still can’t write about it with clarity, because it was such a different world than the one I knew. But it made me curious about economic differences. It made me question the idea of happiness, because the kids I played with, who were desperately poor, were some of the happiest people I’d met. I saw how another country lived, and I accepted what I liked and rejected what I thought made no sense. One of the benefits of traveling abroad is that often, people speak a different language. Why should you travel to a country that speaks a different language? For me, entering a place where I don’t understand the language is humbling. It reminds me I don’t know everything, that I’m teachable. It reminds me that human beings use body language for 92% of our communication, so I have to look people in the eye and really see them. I have to smile and laugh at myself. 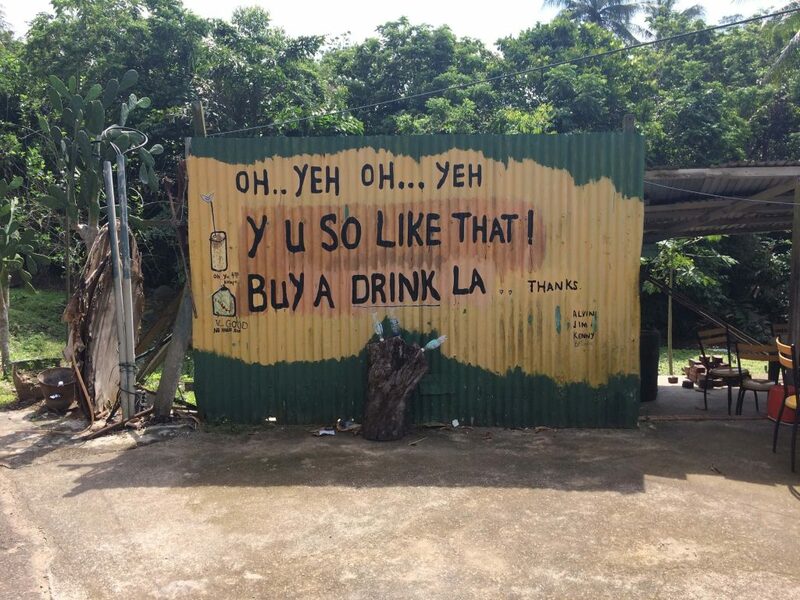 In Singapore, we experienced “Singlish,” the colloquial Singaporean English natives speak. La. Struggling with speaking another language is good for your brain, especially as you get older. It forces your brain to create new neural pathways. It helps remind you that you don’t know it all. And it’s fun! In many ways, it puts you back into that place you occupy as a child when you don’t know how to speak. 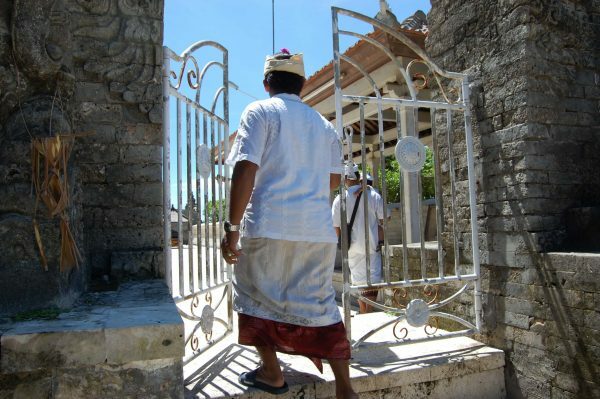 Many times, when you travel to a different country, you meet people who practice a different religion. You have the opportunity to look at another way of doing things that you might never have thought of. You’re forced to do things a different way that might bother you, and you have to think about why that is. In Chile, I was reminded that I always get so annoyed that the check-out process at almost any small store requires that you go to one person to have your purchase bagged, then another to be rung up and give them your money, then a third as you exit the store to check your receipt and make sure you’ve paid (although they’ve seen you just pay a second ago as you’re the only person in the store). For Americans, that lack of efficiency is annoying, because we are all about efficiency, using time wisely, and getting things done. Those are our cultural values. Chileans, however, see this setup as an opportunity to provide jobs to three people, a way to ensure that each person specializes in a different skill, and… I don’t know. I give up. I’m sure there’s a good reason behind it but I can’t think of it. Chileans are more interested in relationships than efficiency. See? This frustrating experience requires me to become more flexible, to swallow my impatience, to readjust the way I frame my world. There are many countries of people whose values are not using time wisely and getting as much done as possible. In fact, they find that value system disturbing. For them, building relationships, involving their community in their lives, and being a friendly and functioning part of society as a whole is more important than accomplishing tasks. Truly. In other countries, you sometimes strike up conversations with random strangers about politics, or economics, or pop culture, and you’re asked to explain why a certain thing in your country is the way it is. This always requires me to think deeply about we are the way we are. Why are Americans so obsessed with pop culture, anyway? (Because in our giant country with so many different ethnicities, pop culture and language serve as a unifier). Most of the time, for us, we realize that our corner of the US is such a small piece of the world. Experiencing a different culture is one of my favorite parts of traveling abroad. When we were in Singapore, we experienced first-hand how obsessed everyone there is with prices, how much things cost, and social status (it’s the most expensive city in the world, so maybe that’s why people want to share the best deal with you). In Thailand, being friendly at all times is a cultural value, and expressing your disapproval or upset just isn’t done. In Spain, however, people tell you how it is, constantly, and you have to get used to the directness of Spaniards. Once you figure out that you can get along with people who are radically different from yourself, even if you don’t agree, it builds confidence. Navigating a totally different world from your own shows you how resilient you can be, and how much fun life can be when you experience novel environments (humans crave novelty–it’s part of our makeup). Some things are the same across all cultures–like little kids huddled around a mobile phone, watching their friend play a game (our boys do the exact same thing). As an ESL Teacher, I experience different cultures every day through my students, and it can be hard, because sometimes other countries don’t explain or understand things the way we do. But that whole process of working through misunderstanding to communicate is very helpful for developing empathy for others. I have a tendency to think I know it all that is constantly under-minded by my daily work as a teacher. And that’s a great thing. Traveling abroad gives you this chance to come into contact with different belief systems and ways of doing things every day. When you travel, having a larger understanding of the culture you’re visiting will help minimize some of those frustrating encounters (like my encounters with the three shop clerks) because it will give what might seem like unusual behavior context. So I do recommend that you study up on the culture of the country or countries where you’re traveling. So I encourage you to go get your passport, if you don’t already have one, and make plans to visit another country, even if it’s just the one next door. You’ll be more flexible, more confident, and more empathetic for having done so. What do you think, readers? 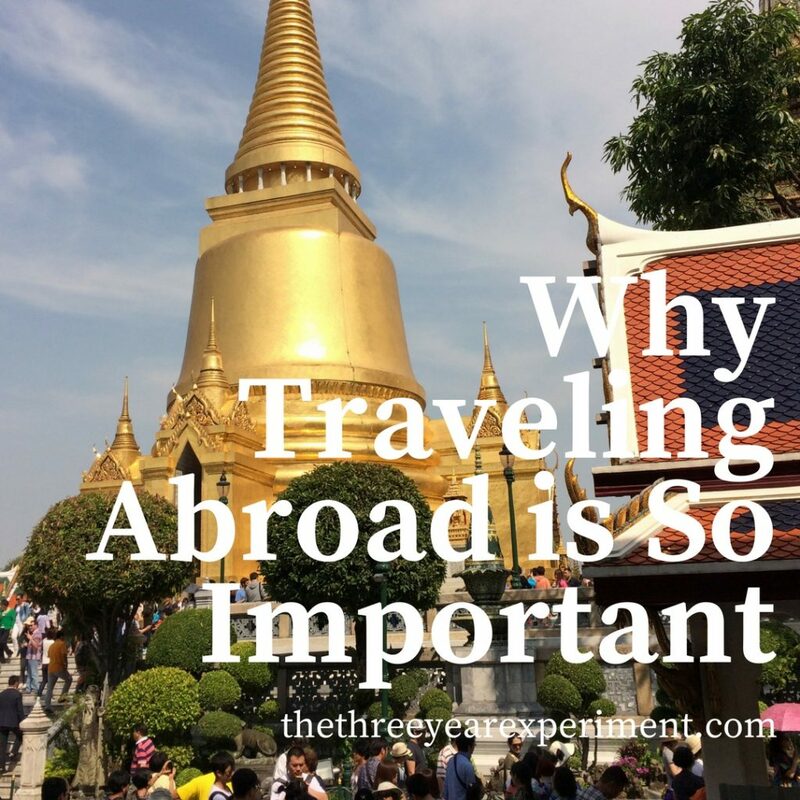 Is traveling abroad essential for you? Yes to all of this! I definitely agree that overseas travel is so valuable for opening up your eyes, letting you realize how small you are in the world, showing you how beautiful humanity can be in such different ways. The poverty in much of the world is desperate and crushing, but it is so important that we see it, even just once in our lives, to rock our perspectives on what wealth (and true happiness, as you said) truly mean. We want to wait until our kids are a bit older before this kind of travel, but I just about can’t wait! Thanks for this post! Wow, how beautifully put, Mrs. COD. Yes, I think it’s hard to understand how much we really have compared to others when we’re just surrounded by people like us each and every day. It’s much easier to realize how wealthy we are when we see people who need to wash their clothes and bodies in the river, or have homes made from cardboard and tin. I think your kids are going to get so much out of traveling, and it sounds like they’ll have a wonderful guide to help point out those differences when you finally do go with them! Travel is a core requirement of a healthy mind. Life is all about perspective. Some of those perspectives can only be experienced by traveling abroad. Yay! Yes! I love it all. Can’t believe you ate coffee beans pooped out of an animal, haha! That’s awesome! Me either! Luckily they wash them many, many times before roasting them! Haha! Yeah, I’m also one that has the travel bug, and want to travel much more when I FIRE. And still got a few European countires to do before then! Living in London probably makes that European travel a lot easier, right? You guys have some awesome discount airlines!! I was just writing a blurb on this and thank you for writing your post so I can link to it! So many of these experiences you list can’t be appreciated through text and video. I’m thankful my parents had us travel quite a bit internationally growing up because it is such a different perspective than staying home. Though I do realize how lucky I am that we had the means to do big trips. And yes, definitely bit by the adventure bug – both domestically and internationally. Angela, let me know if you ever write about those trips! How great that your parents took you on international trips when you were a kid. That’s rare. Makes sense why you have the adventure bug now! Thanks for posting this just as I’m really starting to get nervous about visiting a country where I don’t speak the language on Saturday! I’m very nervous about the language situation, but I must say as an anthropology major I can’t wait to see another culture first hand and experience some new things. Congratulations on your trip, Sarah! Yes, I will tell you that it is nerve-wracking, but I’ve learned that almost everything is solved with a big smile and a self-deprecating laugh. 🙂 I bet you’re going to have an amazing time, especially viewing things through your anthropologist’s eye. I have never left the country, but I hope to one day. Growing up my family never really valued travel. My father likes to stay at home pretty much all the time and my mom is afraid of flying. Ha! Not the best mix for out of country travel. I’d love to do it though. I have a fear of dying without ever seeing the rest of the world. Michelle, I totally believe you’ll do it! Even if you plan a small trip to Canada or Mexico, just to experience the border crossing and entering a different country. I think only something like 14% of Americans have a passport, so your parents are definitely not alone. I have lots of high school classmates who thought traveling to nearby Atlanta was stressful. 🙂 The good news is, even if you can’t or don’t travel for awhile, we have so many videos, pictures, blogs, etc., that you can see a lot of the world without actually seeing it. But if you get the chance, plan a trip! The in-person experience is like nothing else. I have experienced this cultural difference all across the board while here in the Philippines. made me tougher to a point where I don’t let others bother me. We have to understand that others do see things differently and have had a completely different life experience. I speak broken Tagalog, have many Pinoy friends and eat pretty much what they do and hang out in places that they go to. For me it’s amazing diving in to another culture. I wonder if when I return to the UK i’ll be mixing some Tagalog in with some English haha! That’s so true, Mohammed. It really helped me to read some books that explained how I saw the world versus how others saw it. I didn’t have the language to put the differences into words, and having someone else explain, “your culture cares about accomplishing tasks. This culture cares about creating a harmonious society” really helped me understand other people’s contexts better. I bet that Filipino food is amazing. Chicken adobo, oh!! Wow, that is such a different outlook. Just yesterday I was in a diner here where I am familiar with the family. They really are tight knit here, whereas in the West, not so. If you do get the book let me know what you think, it’s 5 recipes and 5 short stories of how I got in touch with those recipes. You’re right. In the US, we don’t tend to be as close to our families as in other parts of the world, like Latin America. In the South, though, we tend to be very family-oriented, which is why Mr. ThreeYear and I mesh so well. I love going to restaurants where you know everyone. It builds a feeling of community. I’m glad you found someone who agrees on such a fundamental concept of family. I totally agree on the community concept, it’s almost as if you don’t even need a mobile phone in those places. You go out and see and speak to people you know. Thanks for signing up and supporting me! Which, to me, makes me so much happier and makes me feel so connected. Love it. I’ve been telling my husband all the reasons why we should travel after FIRE and not for lesiure but for adventure…and food. More food than anything. I’m not leaving the hotel unless there’s food involved. But the culture of food is amazing and excuse enough. I would also like to bring kids up as world citizens instead of being in there own world, one country, I want them to get a bigger grasp of perspectives different from the ones we grow at home. Agreed! 🙂 Man, I love to travel.